This week’s Design File is about the evolution of the Coke bottle. I was never a Coke child. I’m not sure I knew it even existed until I was older. We had Corona instead, and I don’t mean the Mexican beer. On Thursday afternoons, the Corona lorry would turn up outside our house and a small man with a pointy face would jump out. “Afternoon, mum,” he would say to my mother, and I would always think that was rather presumptious, she wasn’t his mum, she was mine. I let it go because he was bringing treasure to the house. Like bottles of lemonade (boring), orangeade (still boring but a bit better) and dandelion & burdock (now we’re talking!). He took away the empties from the previous week, too. We never seemed to waiver from this path and get anything more exotic, like startling red raspberryade or atomic-green limeade so I had to get those at a friend’s house. Corona glass bottles were tall and clear with a raised pimple design on their neck which were reassuringly tactile. My sister and I loved dandelion & burdock, which was dark and foamy. We could easily finish off the bottle in one go but as it had to last the week, it was rationed (God forbid that we might actually order more than one bottle). Lemonade had to be endured but it was brightened when we put ice cream in it to made a creamy mess in a glass that left us with milky moustaches. And then suddenly people started talking about Coca-Cola. To me it was nothing more than a bad imitation of dandelion & burdock, instead of the other way around, but somehow it was becoming more popular. You’d go to a party and there’d be Coke bottles on the table alongside the party cakes and sausage rolls. 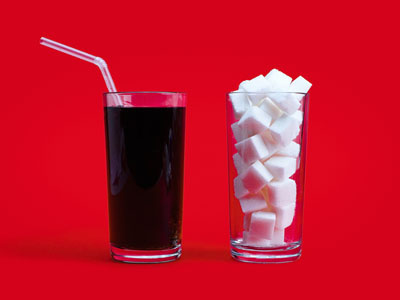 I believed it was a new drink, invented in the late 1960s, rather like those Aztec chocolate bars that were a little bit like Mars Bars only not so good. A proper supermarket opened in the small market town in which I lived and somehow we started getting bottles of Coke at home as well. That put paid to the Corona lorry. What happened to him? I always had a sneaking suspicion he’d been bumped off by his Coke rivals. In that part of South Wales, it was common to see in the late summer the onion men. 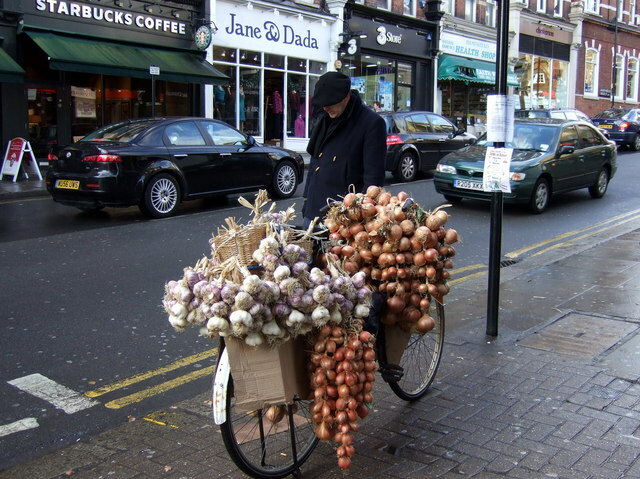 They came over from their farms in Brittany and would cycle around the streets selling the strings of onions that were festooned over their black bikes. My mother always said they were the best. It seems incredible that it was worth their while doing this. I think they sold garlic but we didn’t touch exotic things like that then. Some people bought garlic just to hang in their kitchens as decoration, an accessory of sophistication rather like a wine rack or something colourful from the trendy new shop called Habitat. The onion sellers – Johnny Onion Men, they were called – in their dark clothes and berets seemed as strange and foreign as aliens from another planet but they were proof of another world out there, if only across the Channel, where things were done differently. How much of what we think now is set in stone by our childhoods? Did my liking for dandelion & burdock create the slight distrust of Coca-Cola that I feel even today? Do I still like to imagine that the onions I buy might just possibly come from some field in Northern France? Is this why I still think garlic wreaths are rather smart? The tiny perceptions of childhood sink deep and anchor in the brain, but remain visible, as Jung would note, in our surroundings. The magic of childhood is surely always within us.